In our last blog on Island Diesel, we discussed the signs that your gas injectors need cleaning and how to clean fuel injectors. This month, we’re shifting gears slightly from gas injectors to diesel injectors. How we service diesel fuel injectors is quite different and the process is considerably more complicated. Although there are many types of diesel fuel injectors—and we’re able to assist with all of them—we generally see two main types: mechanical, older injectors, which tend to be less complex, and common rail injectors, which are more sophisticated. It’s important to note that these common rail injectors are much less tolerant of fuel than older diesel injectors—meaning they usually can’t handle poor quality fuel. Oftentimes, we see people who’ve been using the same diesel they’ve always been using on their newer injector. It’s very important to make sure you update your fuel quality as you update your injectors. Much like playing a CD on an iPod…well, it just won’t work. Similar to our gas injector cleaning process, we start with a test when you bring in your diesel injector. At this stage, we use a computerized test bench to operate your injector in as close to real-world conditions as possible. A few years ago, we purchased the Bosch EPS205—the first and only warranty-approved test bench for Bosch common rail injectors. This bench provides the most efficient and precise way to test modern high-pressure fuel components. 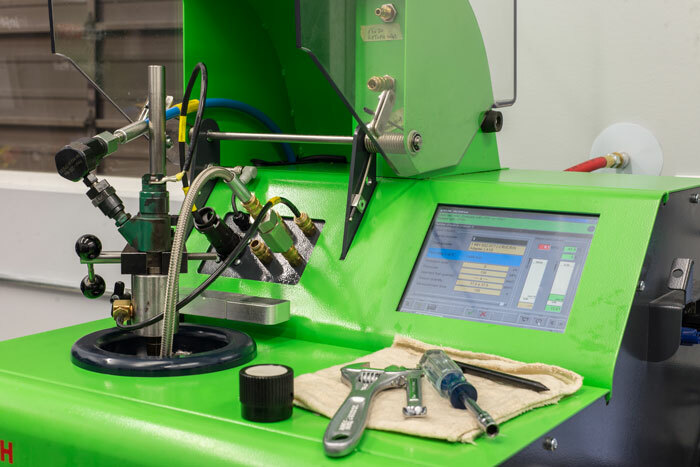 We run tests that include high-pressure nozzle and control valve leak testing, injector start behaviour, idle speed adjustment tuning, full-load quantity, and much more. More often than not, this test lets you make an informed decision about the fate of your injectors and saves you hundreds of dollars— even if some injectors need to be replaced. From our tests, we identify exactly which need replacing so you don’t have to throw away the good with the bad. Similar to gas and common rail injectors, mechanical diesel fuel injector service begins with a test. However, unlike gas injectors, we can take apart the mechanical ones, allowing for a thorough internal investigation. At this point, we disassemble and inspect the mechanical injector, looking for wear, reusable parts, and which parts need replacing. We’re able to service all types of these injectors, including conventional mechanical injectors and 2-spring injectors, always checking for opening pressure, spray patterns, and nozzle chatter and leaks. When possible, OEM nozzles are used, and we return your injectors with a complete installation of washers and seals. Nowadays, there’s no shortage of Internet folklore about your diesel fuel. But remember, that’s exactly what it is: folklore. If you read about adding gas, transmission fluid, or used engine oil to prolong your injectors’ lifespans or to help them through winter…don’t do it. These are the types of things that may have worked years ago, but they no longer help the more complicated injectors of today. Many are computer-programmed to expect diesel. When they receive something other than diesel, they simply don’t know what to do with it! That being said, using high-quality diesel fuel additives, such as Stanadyne or Alliant Power, to your diesel fuel does lengthen the injector’s shelf life. However, ultimately, these injectors do only have a finite amount of life in them and are subject to the normal wear and tear. Some commons signs your diesel fuel injectors might need replacing, cleaning, or, at the very least, testing are smoke or a rough-running engine. Another sign could be if your vehicle’s diesel filter is regenerating more frequently than it usual. When you notice these symptoms, it’s time to bring in your injectors—please do not try to service them yourself. No matter your experience or knowledge, it’s near impossible to precisely, accurately, and efficiently test diesel fuel injectors without the right testing equipment. Call the Diesel Done Right family at (604) 882-3835. Or send us a message to schedule your diesel fuel injector testing. Wondering what it takes to keep your diesel vehicle’s fuel injectors performing? Click the button below to see how a professional should maintain your diesel fuel injectors.